The Symposium on Simulation for Architecture and Urban Design (SimAUD) offers a venue for architecture researchers and simulation researchers to come together to focus on this important area. Buildings are the largest consumers of energy responsible for 48% of all Green House Gas emissions and due to the complexity and multidisciplinary aspects of architecture design and construction, and urban design and society, modeling and simulation become valuable techniques to understand and optimize this enormous challenge. Scientists, engineers, managers, educators, and business professionals who develop or use simulation tools are invited to participate and present original papers. Built environment simulation and design computation have become ubiquitous throughout the design world, from small scale offices to multinational firms. Simulation workflows harness the ever-growing power of personal computers, and the increasing use of cloud computing, to aid design teams in their increasingly complex endeavors throughout the globe. Disciplinary boundaries are blurring, as simulation-based decision support systems bring experts from various fields together to develop low-tech solutions, using high-tech simulation tools. The 9th annual Symposium on Simulation for Architecture and Urban Design (SimAUD) therefore aims at creating a trans-disciplinary scholarly platform by bringing together the brightest researchers and practitioners in the fields of architecture, urban design, urban planning, building science, visualization and simulation. SimAUD offers the opportunity to present innovative simulation methods and techniques and to discuss their roles in bridging disciplinary gaps in urban planning, architecture, engineering, construction, and management. This year’s event will be held at TU Delft’s campus, the largest and oldest Dutch public technological university in the Netherlands. In past years, attendees have included researchers and practitioners in the fields of urban planning and design, architecture and building science, visualization and construction, as well as software developers, managers, educators, and business professionals. Past SimAUD symposia have attracted exceptionally high-quality submissions (papers, notes, works in progress, datasets, and videos). We highly encourage you to take advantage of the free downloads of previous years’ proceedings. We invite you to submit and present an original contribution for SimAUD 2018. All submissions will be peer-reviewed, and accepted full papers will be published in the ACM Digital Library. Please observe the submission types and deadlines on the Symposium website. SimAUD is run collaboratively with ACM/SIGSIM and is sponsored by The Society for Modeling and Simulation International. Below registration is for attending the SimAUD’18 conference event. Included in this registration is access to one workshop. Choose workshop(s) from the area called sessions. You are allowed to choose either one full day workshop or a combination of one morning and one afternoon half day workshops. If you would like to only attend a workshop, register through the Workshop Only Registration Button further below. The conference takes place at Delft University of Technology. The TU Delft campus is one of the largest universities campus in the world, with about 27.000 people travelling across it every day. The campus offers an outstanding number of facilities and is organized as a park, mostly accessible on foot, by bike, or public transport. It includes unique buildings designed by internationally reputed architectural firms, such as the Central Library by Mecanoo. You may have a look at the campus’ map. The conference is hosted by the Faculty of Architecture and the Built Environment, and mostly takes place within the Faculty’s building. The Faculty was established in 1904. Currently, it counts about 3000 students and hundreds of staff members. It has an international leading role in education and research, being raked in top positions. The 2017 QS World University Rankings by Subject, listed the Faculty as third worldwide. The Faculty’s building is named BK-city and is located at the edge of the campus, adjacent to the city center of Delft and well connected to it. BK-city is a recently renewed building, transformed into a stylish 36,000 square meters space for studios, workshop rooms, CNC facilities, research labs, own library, conference rooms, cafe, restaurant and other facilities. The building includes exceptional spaces by famous architectural firms, such as the Tribune of the Orange Hall by MVRDV. The video below offers a sneak peek into the building. You may also have a look at its map and general guide. 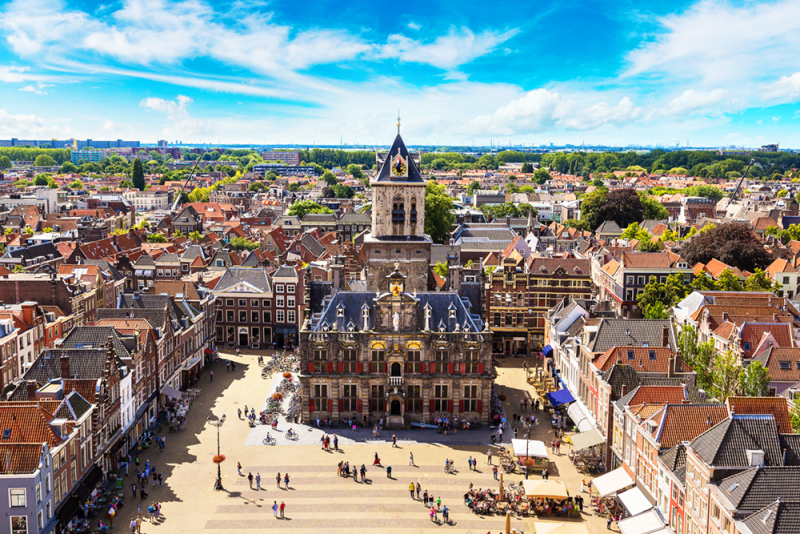 In Delft, the majority of Hotels and B&B are situated in the city centre. Most of the historical city centre is within walking distance from the TU Delft Faculty of Architecture. 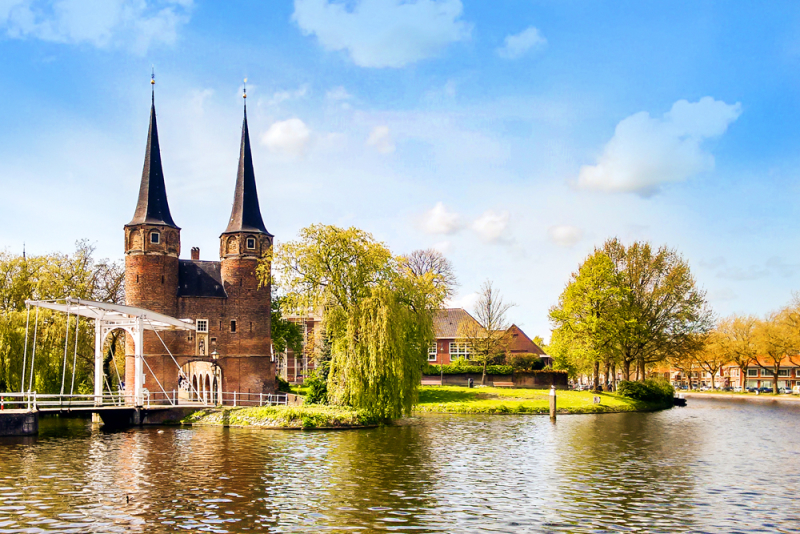 The availability of accommodations in Delft is very limited. To guarantee a good Hotel or B&B room in Delft, booking well in advance is highly recommended. 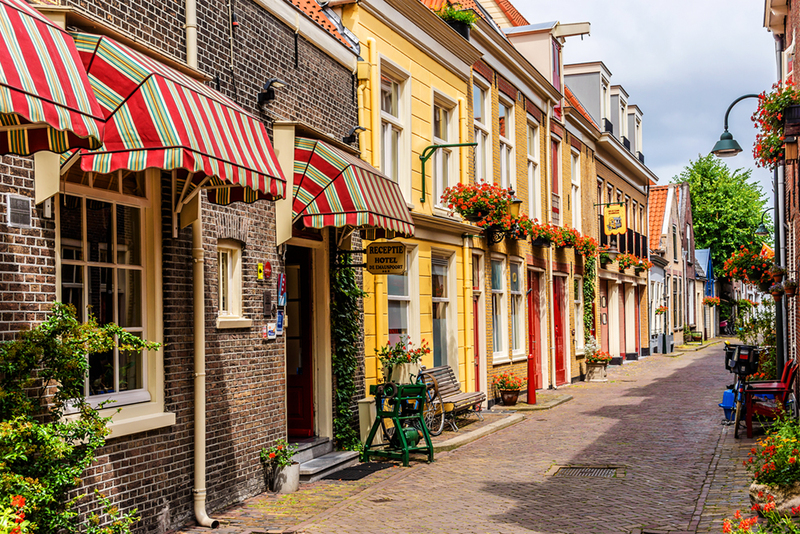 Alternatively, Rotterdam and Den Haag are not far and provide a larger variety of accommodations. 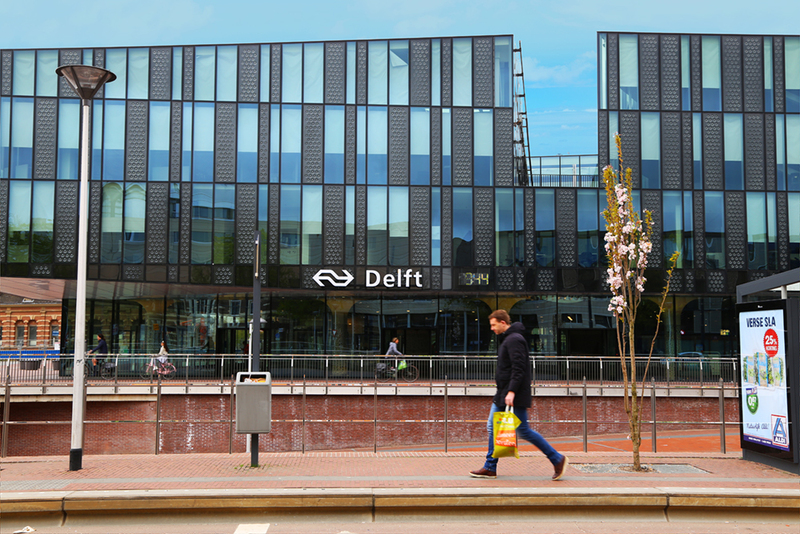 To check the public transports and needed connection-time from an accommodation to the conference venue, 9292.nl offers a good overview. For the SimAUD registered attendees, the hotels listed below offer special rates. A code is needed. Each Hotel requires a different code. Please contact the conference organizers. We are pleased to announce that several workshops are being organized as part of SimAUD 2018. The workshops will take place in parallel sessions from 9:00 AM to 5:00 PM on Monday, June 04. The workshops will address the topic of simulation from a unique perspective and will offer hand-on learning opportunities on cutting edge computational approaches, workflows and tools. Workshops run for either 3 hours (Half Day) or 6 hours (Full Day). Each workshop has a maximum number of participants on a first-come first-serve basis, and require a minimum of 5 participants to take place. If a workshop is cancelled due to non-sufficient subscriptions, participants can join one of the other workshops. Registered conference attendees will have free access to the workshops. A small fee applies to the others participants (full fee: $70 – student fee: $25). The schedule and venue details below will be updated shortly. Below registration is for workshops only. If you would like to register for the entire SimAUD’18 event, register above. One registration allows attendance to either one full day workshop or a combination of one morning and one afternoon half day workshops. Review session summary for requirements to attend. This workshop aims to introduce a novel workflow in achieving optimum adaptive techniques to retrofit existing non-energy-efficient buildings. The workshop addresses the case-study of designing a performance based skin for a building to act as a solar protection retrofitting strategy. The skin’s main function is to reduce the solar radiation impact on the building while allowing the appropriate amount of daylight to enter the space. The participants will be introduced to specific parametric design presets in Grasshopper 3D. A multi objective optimization process will be performed to reach the optimum second skin iteration using integrated optimization tools in Grasshopper. Participants will be provided a real case-study for the application in the workshop. The first objective of the optimization is the form finding of the second skin with respect to solar radiation. Second, perforations will be designed in the skin for daylight penetration and optimization takes place once more. Participants will consider achieving a balance between daylight availability, energy performance and exterior view percentage. Finally, the optimum configuration will be the output among the different cases, which balances the performance between all the previously mentioned parameters. Through the workshop, participants will get the adequate knowledge to perform building performance simulations, some paneling techniques and optimization of different parameters. Mostafa Atwa is a lecturer assistant in the Architecture and Urban design Program at the German university in Cairo. He has previous experience in teaching in the American University in Cairo and the Future University in Egypt. He is specialized in Parametric Design, Building Energy Simulation, Daylighting and Building Skins. Mostafa is a research assistant in PVT-RESyst funded research project that focuses on integrative renewable technologies for buildings in hot-climates. He instructed several academic courses, workshops and lectures internationally and locally for undergraduates, graduates and professionals in a variety of international engineering firms. In addition, he has experience as a professional architect and he is founding partner of Das Viertel architecture. Ahmed Fayed is a teaching assistant at the American university in Cairo. He is interested in Parametric Design, Building Simulation and Green Architecture. He gave several workshops and lectures for undergraduate students and architecture professionals. Ahmed is now focusing more on integrating the parametric design and building simulation process within professional practice while coping with the market needs throughout his architecture design studio Das Viertel. The objective of this 6-hour workshop is to demonstrate to architecture and civil engineering students, researchers and practitioners familiar with digital design tools, the – still unexplored – potential of combining optimization technology in building and architectural modeling. Participants will hear about successful applications from the AEC industries and will have the chance to try the leading multidisciplinary optimization (MDO) platform modeFRONTIER, being guided by ESTECO experts providing training, tips and advices. Participants may follow the hands-on training bringing their own laptops (Windows, Linux or Mac OS). They will receive instructions about how to download modeFRONTIER software and get a demo license in advance. They will need to have GrassHopper and Rhino version 5 already installed on their laptop, including some plugins (Ladybug, Honeybee, EnergyPlus 8-4-0 and Karamba; details will be provided by email). In case the software are not available, the participant can follow anyway the live demo, and work on the other hands-on using only modeFRONTIER. Alberto Clarich received his PhD in “Innovative Parameterisation and Optimisation Methodologies in Aeronautic Field”, University of Trieste (2003), in collaboration with Dassault Aviation, having a background as Mechanical Engineer. He has published several articles in journals and conference proceedings, in Multi-Disciplinary Optimization field. Since 2004 he is working at ESTECO as Optimization expert, and from 2010 he is Manager of Engineering Service & Support Department of ESTECO. Our tools are running on the LINUX operating system. A few days before the workshop, we will provide the registered participants with a virtual LINUX machine (Ubuntu) with our tools already preinstalled and with the instructions to install it on their laptops using virtual box software (http://www.virtualbox.org). A knowledge of the basic LINUX commands is absolutely required to follow the workshop. Alternatively, for those participants already familiar with LINUX, we will provide detailed instructions to install our tools, which are distributed as open sources. Raphaël Compagnon MSc in Physics at EPFL in 1986 and PhD in Technical Sciences while attached at the Laboratoire d’Energie Solaire et de Physique du Bâtiment (LESO-PB) in 1993. Visiting research associate at the Martin Centre for Architectural and Urban Studies (Cambridge, UK) in 1997. Since then, prof. of building physics and sustainable development at the School of Engineering and Architecture in Fribourg, Switzerland. Associate member of the Passive and Low Energy Architecture organization (PLEA). Christina is an architect with specialisation on environmental design of buildings and neighbourhoods. She holds a PhD from the University of Kent (UK) and a Master degree from Cardiff University (UK). Her doctoral research has been published in several international journals and conferences. She has a four-year teaching experience in architecture schools and is an Associate Fellow in the British Higher Education Academy. Her latest post was that of the main researcher in the INDALUX project at the Smart Living Lab in Fribourg (Switzerland). Learn to accelerate your research through the power of modeling with COMSOL® Multiphysics. In this workshop, you will be guided through the basics of simulation, and set up your own model with help from a tutor. We start at an introductory level, leading attendees through the essential steps needed in all analyses (geometry creation, meshing techniques, model setup, postprocessing, etc). No background knowledge on numerical analysis is needed. The covered topics include mechanical analysis, heat transfer, fluid flow (CFD), electromagnetics, acoustics, and more. A free trial version of COMSOL® Multiphysics is included. Windows 7 or newer, Linux, and Mac OS. Make sure you have installation rights on your computer. Request a trial version via ruud@comsol.com in advance! Ruud Börger received his MSc. in Physics from Groningen University. Before joining COMSOL, he worked for Philips as a Design Engineer. He has over ten years of numerical modeling experience. This workshop will introduce participants to (some) theory and application of uncertainty and sensitivity analysis in simulation from the perspective of practitioners. Specifically, we will use weather inputs as an example to demonstrate approaches and discuss their interpretations. The examples and discussion will be based in the world of building energy simulation, though the presenter will steal from other fields without shame. This workshop is aimed at motivating practitioners and researchers to systematise their thinking about uncertain factors and decision-making under uncertainty. We will use a black-box model, since running an energy simulation in real time will be impractical for the demonstration and practicum. Parag Rastogi is a building scientist with a background in civil engineering. He received a PhD from EPFL (Switzerland) and Bachelors and Masters degrees from Purdue University (USA). He is the lead building physicist at arbnco, an innovative building simulation company based in Glasgow, UK. He is also a visiting scientist at University of Strathclyde, Glasgow, and RIKEN-AIP Institute in Tokyo, Japan. His research focusses on integrating modern statistics, data analysis, and AI-inspired methods in understanding simulated and measured data from the built environment, particularly for uncertainty-aware decision-making in the built environment, climate-related risk, well-being in buildings, optimising renovation recommendations, etc. This workshop investigates the capacity of virtual reality (VR) to facilitate the communication and understanding of the quantifiable information generated through design simulation and analysis. It will introduce participants to VR as a representation tool, demonstrate how virtual environments are generated, and invite participants to collectively build a virtual environment which includes 3-dimensional data representations of their own design. The virtual model will be built at an urban scale and focus on representing analysis data critical to an urban metabolism including but not limited to daylighting, temperature variation, resource allocation, demographic distribution and zoning. At the conclusion of the workshop, participants (and later conference attendees) will be able to virtually walk through the city and interactively engage with the overlapping layers of data representation that they have created. It is expected that participants will recognize how VR design environments can stimulate comprehension of quantifiable data and support the discovery of novel relationships between interrelated data and its physical setting that are critical to urban planning and decision-making. All participants will need a laptop with modeling software of their preference with the capacity to export model files as a .fbx file. Windows and Mac laptops will be supported. Participants may choose to install freely available gaming engine software on their laptops prior to the workshop but this is not requisite for participation. Amber Bartosh is a LEED-accredited architect and interior designer who has designed and managed award-winning projects in the United States, China, Kuwait, and the U.A.E. She received her B.A. in Art and Architecture from Rice University and her M.Arch from the Southern California Institute of Architecture (SCI-Arc). Amber is currently an Assistant Professor at Syracuse University School of Architecture, a Syracuse Center of Excellence Faculty Fellow, and co-director of the Interactive Design and Visualization Lab (IDVL). Her work focuses on the architectural application of emergent materials through physical prototyping and advanced visualization technologies including virtual reality simulation. The aim of this workshop is to provide the participants with a hands-on experience in an intuitive and hybrid design environment in which Virtual Reality (VR) and Robotic Fabrication techniques are used. Virtual Reality and Robotic Fabrication allows us to integrate the digital and the physical media of the designer. This integration enables immersive design environments in which reciprocal feedbacks between the virtual and the material are possible. In this workshop, the participants will have the opportunity to make conceptual 3D designs in a VR environment and to fabricate them using a robotic arm by performing certain computational optimization steps which are required for the fabrication. The physical outputs can then be digitized for further improvements and the improved designs can be fabricated using the robotic arm. By this means, the participants will be able to experience a cycle which includes recursive steps performed between the virtual and physical representations of a design concept. Eventually they will gain insight on how to develop a 3D form using a VR set, how to perform simple optimization operations on the form towards its fabrication, and how to control a robotic arm. Personal laptops with Windows 7 or above are required. Serdar Aşut is an architect with a PhD degree in Informatics from Istanbul Technical University. He is an educator and a researcher at TOI: The Chair of Design Informatics at TU Delft. His works focus on creative making with the support of digital tools and computational techniques. Arno Freeke is a 3d modeler, VR AR enthusiast and a lab coordinator at the TU Delft, looking for new graphic technologies to use in education and research and helping others with their needs for using VR, AR & animations for in their projects. He spends his time modeling and creating VR content for VR games and is co-founder at Barricade Studio. The Morphogenetic Fluid Dynamics workshop aims to introduce a performance-driven design methodology, through exploring the ideas of shape optimization and iterative simulation feedback. The workshop will look into the morphogenetic potential of fluids, based on the use of Computational Fluid Dynamics simulations and Computational Design processes. Working with a real world scenario and objective and through analyzing the context and data of the given site, participants will be asked to use introductory level parametric geometry and simulation tools to explore the effects of their design on the airflow and ventilation of the building. Angelos Chronis is a PhD Candidate (Marie-Curie Fellow) at the Institute of Advanced Architecture of Catalonia in Barcelona, as a member of the Innochain Marie-Curie ITN network. Previously he has been working as an Associate for the Applied Research + Development group at Foster + Partners. His main research interest lies in the integration of simulation, optimization and performance drive in the design and fabrication process with an expertise in computational fluid dynamics (CFD) while he also works across other fields including virtual & augmented reality, interactive installations, 3D scanning, spatial analysis and parametric design. The workshop starts with an introduction to robotic building and design to robotic production methods. Participants will learn basics of inverse kinematic simulation and parametric toolpath generation. Both subtractive and additive methods of robotic production will be explained and the goal is to produce physical prototype using a hard material such as Expanded Polystyrene and soft material such as silicon to be robotically 3D printed. Moreover, in order to bridge the two processes , 3D scanning of subtractively produced components shall be applied that updates the additive production toolpath. The workshop includes hands-on experience of robotic programming and production and the results are physical prototypes. Familiarity with digital and parametric modeling is recommended but not required. The studio will include hands on experiments for which required tools and equipment will be provided. Participants may bring their laptop with software installed before the workshop starts. Before the workshop starts, participants will receive installation package. Sina Mostafavi is a practicing architect, researcher, and educator with expertise in design computation and architectural robotics. Has practiced since 2007, he is the founder of studio SETUParchitecture. Since 2011 he is a PhD researcher at TU Delft and in 2013 he co-initiated Robotic Building lab at Hyperbody, where he is currently a senior researcher and lab manager. He is teaching design studios at Delft and Dessau Institute of Architecture. He has published and presented internationally such as in eCAADe, AA-London, ACADIA, Rob|Arch, Paris-Malaquais, and work by him are exhibited in multiple galleries such as V2 Rotterdam and Centre Pompidou. After graduating in architecture (1998) from the Technical University Karlsruhe, Henriette Bier has worked with Morphosis (1999-2001) on internationally relevant projects in the US and Europe. She has taught digitally-driven design (2002-2003) at universities in EU and since 2004 she mainly teaches and researches at the Technical University Delft (TUD) with focus on computational design and robotics in architecture. She finalised her PhD in 2008 and founded later the Robotic Building group at TUD. 2016 she has been appointed associate professor and 2017 visiting professor at Dessau Institute of Architecture in Germany. More recently she cofounded the international network Adaptive Environments with its publication platform in the Springer Book Series Adaptive Environments. Benjamin Kemper most recently finished his master degree in robotic building (MSc) at TU Delft , where he also worked as a robotic workshop assistant, collaborating with DIA Dessau (Bauhaus). He earned his bachelor degree (BA) in architecture at the Cologne University of Applied Sciences. Early in his academic career, Benjamin gained prototyping and manufacturing experience through several major architectural 1:1 installations and prototypes. He frequently experiments with 3D printing, 6 axis robotic milling, cutting, and printing, 3 axis CNC milling, laser cutting, and machine hacking. His latest research focuses on merging parametric modeling and computer graphic imagery into tangible prototypes. Yu-Chou Chiang is a PhD researcher at TU Delft developing strategies for Design-to-Robotic-Production (D2RP). He has an engineering background and worked as educator and researcher in the Department of Civil Engineering, National Taiwan University. Since 2017, he works on a PhD with focus on mobile build-on-demand D2RP and assembly involving human-robot collaboration. After a general introduction to spatial analysis methods, you learn in this workshop how to use components from the DeCodingSpaces-Toolkit in Rhino/GH for the quantitative analysis of urban space. Based on these analyses we implement a basic urban development simulation for a case study city. The presented DeCodingSpaces-Toolbox for Grasshopper is a collection of analytical and generative components for algorithmic architectural and urban planning. The toolbox is free software released by the Computational Planning Group (CPlan). It integrates established urban analysis methods, extend them with new features and introduces new methods for the analysis and synthesis of urban morphology. Reinhard is Junior-Professor for Computational Architecture at Bauhaus-University Weimar and Principal Scientist at the Center for Energy at the Smart and Resilient Cities competence unit at the Austrian Institute of Technology (AIT) in Vienna. In addition, he acts as Co-PI in the Big Data Informed Urban Design group at the Future Cities Lab (FCL) at the Singapore ETH Centre. His current research interests are applicability of multi-criteria optimization techniques for planning synthesis, cognitive design computing and correlations of computed measures of spatial configurations with human cognition and usage of space. Martin is a research assistant at the Chair of Computer Science in Architecture at the Bauhaus-University Weimar in Germany and co-founder of the DecodingSpaces GbR. He graduated in architecture and urban planning in 2011 at the Faculty of Architecture, Slovak University of Technology. Since 2012, he worked as lecturer and researcher at the Bauhaus University Weimar. His main research interest is computational analysis and simulation of urban systems and application of these methods in planning process. As associate investigator at Emerging Cities Lab in Addis Ababa, he positions his research in context of rapid urbanization. Sven is a lecturer and researcher in the field of architectural planning support systems. He is interim professor for the chair of computer science in architecture at the Bauhaus-University Weimar and founding partner of DecodingSpaces GbR. He studied applied computer science at TU-Chemnitz and graduated in architecture at the TU-Dresden and BU-Weimar. He completed his PhD in 2016 on the topic of automated spatial layout design from a user-perspective. His main research interests lie in the development of measures for evaluating the built environment and generative methods for supporting the design process. The workshop aims to explore next generation parametric design by experimenting with a novel cloud-based parametric platform called Packhunt.io (http://www.packhunt.io). The participants will go through a series of lectures, discussions and small hands-on modelling exercises to explore the possibilities of next generation parametric design to model and use design knowledge. Next generation parametric design is a novel means to start modelling design knowledge for (amongst others) conceptual design processes. If parametric design can take over the laborious tasks (‘the sweat’) the intelligence and the creativity of the engineer or designer remains. This workshop aims to experiment with this novel approach to find out how far the boundary can be moved. Participants will receive a 3 month demo license for Packhunt.io and will need to bring Rhino / Grasshopper on their own laptop. Jeroen Coenders is CEO and co-founder of White Lioness technologies, a start-up which develops Packhunt.io (http://www.packhunt.io), a next generation parametric platform which (amongst others) can be used to sell (parametric) products online, to design products and projects and to facilitate collaboration. This platform is currently applied in many different industries and sectors such as eyewear, sportswear, medical, jewellery, fashion, but recently also the AEC. Prior to White Lioness, Jeroen has founded the computational discipline within Arup Amsterdam and coordinated virtual design for Europe in Europe. He has been deeply involved in projects such as NSP Arnhem station and the Guangzhou tower. This workshop, based on the Speckle Design Data Exchange Protocol developed at UCL within the InnoChain H2020 programme, aims to stage a high frequency iterative digital design workflow between several “simulated” stakeholders roles in an architectural office: design, analysis and simulation (optionally, based on number and interest of participants) reporting. In short, the goal of this workshop is to prototype a truly open, concurrent and integrative design process through meaningful dialogue between design and analysis, engineers and architects. By coupling these roles in an active real time dialogue, we aim to reduce some of the friction traditionally associated with the design process and prototype a truly open design process. Attendees are required to bring their own laptops with Rhino, Grasshoper and (optionally) Excel or any other spreadsheet software. Dimitrie Stefanescuis a Marie Curie Fellow (ESR) at The Bartlett UCL working on open data communication protocols for the AEC and Design industries with the aim of empowering an integrative and curated design process. Paul Poinet is a Marie Curie Fellow (ESR) at the Centre for Information Technology and Architecture (CITA), researching on Multi-Scalar Modelling for building design, aiming at improving design workflows during both early and late design stages. Giovanni Betti is the Head of the Performance Based Design Team at HENN Architects in Berlin. His work spans across architectural and engineering disciplines. He has considerable experience of producing outstanding, concept-driven award-winning architectural projects in Germany, UK and overseas. This workshop empowers building simulation and analysis experts to process and visualize large amounts of data using the Python programming language. We will cover the basics of Python, the Pandas data analysis library, and the Jupyter platform. We will process data sets from real building-related analysis scenarios on the participants’ laptops. This workshop serves as a starting point for a lifetime of happiness using Python. We will use the Microsoft Jupyter Notebook cloud platform which is free and needs no installation. Dr. Clayton Miller is an Asst. Professor at the National University of Singapore where he leads the Building and Urban Data Science (BUDS) Lab. He is a researcher/engineer/architect/data scientist with a professional identity crisis who promotes the joys of using Python for processing and visualising spatial and temporal data from the built environment. He loves to spread the good news on how to use Python, Pandas, and the Jupyter platform for data analytics and reproducible research. Organized into 3 sessions, this workshop will provide a theoretical and practical introduction to measurement, modelling and simulation for the non-image forming (NIF) effects of light in buildings. The first session, offered by Martine Knoop, Aicha Diakite, and Frederic Rudawski from the TU Berlin, will present spatially resolved spectral sky measurements and new techniques for developing spectral sky models to appropriately characterize daylight. The second session, taught by Jon Sargent from Solemna, will introduce ALFA – Adaptive Lighting for Alertness – a lighting design software providing physically accurate simulations of spectral lighting in architectural and non-architectural environments. In the third session, Marilyne Andersen and Siobhan Rockcastle from OCULIGHT dynamics will present OCUVIS, a web-based tool for visualizing building-scale simulation results for non-visual as well as visual performance. There are no specific space requirements for this workshop, but attendees will be given instructions on how to download any necessary tools and plugins ahead of time so that they may follow along on their own laptops. Siobhan Rockcastle is an Assistant Professor of Architecture and Director of the Baker Lighting Lab at the University of Oregon. Her expertise connects architectural design with building performance simulation and experimental research. Siobhan recently co-founded OCULIGHT dynamics, a daylight consulting company offering specialized simulation workflows for human-centric light performance. Her research explores the impacts of daylight on human emotion, relying on user experiments to derive prediction models for simulation-based methods of analysis. She has a B.Arch from Cornell, a SMArhcS from MIT, and a PhD in Architecture and Science of the City from the EPFL. Marilyne Andersen is a Full Professor of Sustainable Construction Technologies, Dean of the School of Architecture, Civil and Environmental Engineering, and Head of the LIPID Lab at EPFL. She a recent co-founder of OCULIGHT dynamics and has been working at the interface between architecture, physics, and engineering throughout her academic and consulting career. She works on a wide range of subjects, including visual and thermal comfort, tools for early stage design, circadian photoreception and health, and advanced facade technologies for daylight redistribution. Marilyne has a M.Sc in Physics and a PhD in Building Physics from EPFL. Before joining the faculty at EPFL, she was an Assistant, then Associate Professor tenure-track at MIT. Martine Knoop is Lecturer at of the Chair of Lighting Technology, Technische Universität Berlin. She is responsible for research and education on indoor lighting, daylighting and colorimetry. Before taking up her assignment at the TU Berlin, she was a senior application specialist of Philips Lighting, the Netherlands and part-time visiting professor at Eindhoven University of Technology. Her current research focuses on the unique characteristics of daylight responsible for the user preference for this light source, to promote and improve daylight design, as well as to develop new adaptive electric lighting solutions, to enhance user well-being and performance in indoor spaces. Aicha Diakite is a researcher and lighting engineer working in the field of daylighting, sustainable urban planning and environmental modelling. She is currently working at the Chair of Lighting Technology at the Technische Universität Berlin (TUB). Her doctoral research proposes new spectral sky models to enable the integration of daylighting strategies into the design of urban structures that support people’s well-being. Aicha received several awards for her work including the H.-J.-Helwig-Prize 2014 by the German Society of Lighting Technology, the Hans-Peter-Willumeit-Award by the Center of Human-Machine Systems and the Clara-von-Simson-Prize honoring women in science and engineering by the TUB. Frederic Rudawski has been working as an undergraduate assistant at the Chair of Lighting Technology, Technical University of Berlin since 2014. He is currently writing his diploma thesis “Determination and representation of spectral and spatial distribution of daylight in interiors”, addressing the issue of daylight measurement methods with aspects to non-image forming effects. He has assisted in a variety of research projects at the Chair of Lighting Technology and has developed a number of analysis programs for different measurement stations. Jon is an architectural designer and software developer based in San Francisco. As VP of Product for Solemma, Jon creates tools that help architects and consultants evaluate the daylight performance of their projects. His areas of focus include daylight simulation workflows, circadian lighting, and data visualization. Prior to working full time at Solemma, Jon worked as a designer at Skidmore, Owings & Merrill in New York and San Francisco, where he applied data-driven methodologies to a number of award-winning international projects. Jon holds an M.Arch with distinction from Harvard’s Graduate School of Design. The workshop SMART Hospital architecture connects mapping movement based on administrative patient data and tracking devices to (BIM) and human behaviour simulation. Based on a blueprint for an Activity Based Building Simulation Model, this colloquium explores the boundaries of this approach. The blueprint (presentation 1) is a theoretical framework that connects actual on-going hospital’s logistics flows (patients, professionals, equipment) to BIM. The first step in this blueprint is mapping the actual flows based on real-time tracking devices and visualizing these flows in BIM (presentation 2). In addition, understanding patient flows based on the patient records gives insight in the movement between departments of patients following their path of cure (presentation 3). The last step is how this kind of data also can be used for simulations of architectural layouts in connection to the way people with their behavioural intentions use the physical environment (presentation 4). The purpose of the simulations is to make the built hospital infrastructure of future facilities more efficient, but also to optimize processes in current facilities. Also the consequences of architectural layouts on patient and work flows can be made visible, as well as the impact of changes in the amount of patients, deviations in time and patient mix. Besides presenting the state of the art of research, this colloquium also seeks coalitions to further develop this approach. All presenters are involved in a joint EU Horizon 2020 COST Action proposal related to this topic with several other universities and research institutes in Europe. Johan van der Zwart studied Architecture (MSc) and Real Estate Management (PhD) at Delft University of Technology and Healthcare Management (MSc) at the Erasmus University Rotterdam. His PhD thesis ‘Building for a Better Hospital’ investigates the planning and decision process of 15 Dutch Hospitals. His MSc thesis Healthcare Management ‘Smart Hospital Architecture’ searches for organizational performance indicators to measure outcomes of healthcare process simulations in a virtual architectural environment. He works now as University Lector and Researcher Architecture & Health at NTNU Norwegian University of Science and Technology Trondheim. Dominique Brodbeck is professor for Biomedical Informatics at the University of Applied Sciences and Arts Northwestern Switzerland (FHNW), as well as founding partner of the company Macrofocus GmbH. His activities focus on how to extract meaningful information from large amounts of complex data, and how to make it accessible to humans in a useable way. He works in the areas of data visualization, computational information design, visual analytics, and advanced user interfaces. Dominique Brodbeck has a PhD in Physics from the University of Basel, Switzerland, and holds an Executive MBA in Management of Technology from EPFL/HEC Lausanne, Switzerland. Nirit Putievsky Pilosof is a Ph.D. student at the Faculty of Architecture and Town Planning at the Technion, Israel Institute of Technology. Her Ph.D. focuses on Evaluation of Hospital Design Strategies for Future Change. Nirit holds a Post-Professional Masters of Architecture from McGill University in Montreal, Canada, and a B.Arch and B.Sc in Architecture, with first class honors, from the Israeli branch of the University of Wales. Nirit practiced architecture as a team leader at various architecture firms in Israel and Canada, specializing in hospital design, public buildings and residential housing, as well as teaching as an architectural studio instructor. Designing high-quality public space and landscape requires a good understanding of the environmental context. Landscape and urban scale design imply also the modulation of elements such as surfaces, fields, vegetation, water or ground. These territorial and urban scopes hold both a dynamic charge and symbolic charge with the realm of physical planning. The main task of this workshop is to investigate new approaches to create a global and coherent project interacting with the environmental factors. Rhinoceros3D and Grasshopper form the core of the workshop, in which external data and editable parameters should be implemented to generate diverse project solutions. Assistants will be shown some examples that illustrate how to analyze, visualize and interact with some environmental data such as air quality, wind, radiation or pluviometry [1h]. Afterwards, they will learn how the data can be used as a direct design tool. Finally, we will explore the possibilities of this data-crossing process, combining at least three fields of expertise of those taken into account (wind, water level and radiation) [2h]. We will discuss the strategies and case studies combining these inputs. Laptops with educational version of Rhinoceros 3D and Grasshopper. Plug-ins such as python and ladybug will save time. Sergio del Castillo Tello and Elisa Pozo Menendez are both architects by Universidad Politécnica de Madrid. They are both specialist in visual programming and teach 3D modeling, rendering and profesional workflows in different universities, centres and studios. Sergio is the coordinator and co-founder of the Master in Advanced Infographics in Universidad Politécnica de Madrid. He is also co-founder of NaNetwork.net, where he has been working on multiple competitions and projects. Elisa is specialized on Urbanism, Territorial Planning and Environment and Sustainable Cities by Institut Français d’Urbanisme. Both have been collaborating together in several workshops, projects and competitions since 2013. Please fill out the Student Verification Form and send to the SCS Office at scs@scs.org to receive the Student Discount Code. Digital Library. Papers must not have appeared before (or be pending) in a journal or conference with published proceedings, nor may they be under review or submitted to another forum during SimAUD’17 review process. At least one author of an accepted paper must register for the symposium and must present the paper at the symposium. All abstracts and manuscripts must be submitted using the SimAUD 2018 Online Submission Site. For the abstract submission, please submit your paper summary through the online submission site, and you will be able to update it at the time for the full paper submission. Note: All Submissions are published in SimAUD’s Proceedings. Full papers (max. 8 pages) present significant contributions to research and practice in the SimAUD areas. Accepted full papers will be archived at the ACM Digital Library. Links to SimAUD papers in the Digital Library are posted at www.simaud.org/papers.php. Short papers are non-archived publications (max. 4 pages) that present brief and focused research contributions that are noteworthy but may not merit a full paper. Typically, short papers provide an overview of research-in-progress and/or thought-provoking work relevant to the SimAUD community. They have not reached completion level necessary for jury review and acceptance as complete papers; however, authors will benefit from in-person feedback from symposium attendees. In order to help bring together diverse disciplines we aim to establish a common language of perspectives, case studies, techniques or technologies. One way to start this process is through invited works. The Committee may internally evaluate and invite certain papers, data sets, or videos to include in the symposium outside the formal peer-review process. To nominate research that you believe would be beneficial to building this new community, please email any of the chairs with suggestions. Many architecture and urban design projects communicate visions of a proposed future. Posters and videos are among the best ways to communicate these visions. We invite video and poster submissions of high-quality scientific visualizations of architecture or urban design projects, interactive design decision support systems, compelling animations of construction simulation, and more. We strongly encourage authors of full and short paper submissions to also provide a high-quality video for peer-review and exhibition at the SimAUD symposium. Accepted posters and videos will be featured at SimAUD’s website. If you plan to provide a video or poster, please notify the General Chair by email prior to the submission deadline. Data sets are optional (but recommended) collections of ZIP files of original data that accompany full or short paper submissions. A data set submission may include, for example, a detailed Building Information Model (BIM) of a real or virtual building that would be of use to the SimAUD community for simulation testing or cross-validation. Another example would be a conceptual model of a process or event expressed as DEVS classes. Other data sets could be point clouds, sensor data, programs, models of HVAC units, fridges, escalators, geothermal, etc. Many scientific communities suffer from a lack of access to high-quality detailed data sets and algorithms. At SimAUD, an accepted peer-reviewed data set is recognized as a significant contribution to science, and we hope to encourage researchers and practitioners to share their data for the greater good of the community. Data sets will be linked or archived at www.simaud.org/datasets. If you plan to contribute a data set, please notify the General Chair by email prior to the submission deadline.